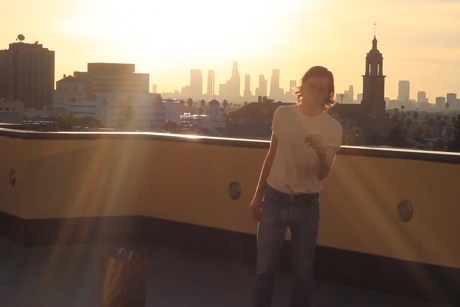 Nicholas Krgovich's new album On Sunset is a melancholic tribute to Los Angeles, and his video for "Along the PCH on Oscar Night" offers an appropriately deadpan glimpse at the City of Angels. In the clip, the No Kids/P:ano/Gigi leader sings along with the catchily downcast soul-pop tune, dancing along with the peppy beat and gazing forlornly at the pool in hillside mansion overlooking Los Angeles. At times, we see him silhouetted against the sunset, while other shots are uncomfortable closeups. Watch the Peter J Brant-shot clip below [via Esquire]. On Sunset will arrive on September 23 through NK World Service/Tin Angel.